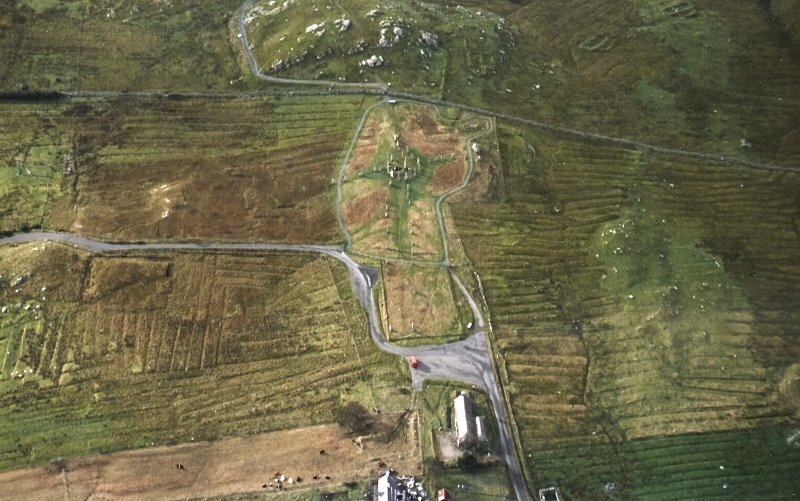 Oblique aerial view centred on the remains of the stone circle, chambered cairn and stone alignments with the blackhouse and lazy beds adjacent, taken from the NE. 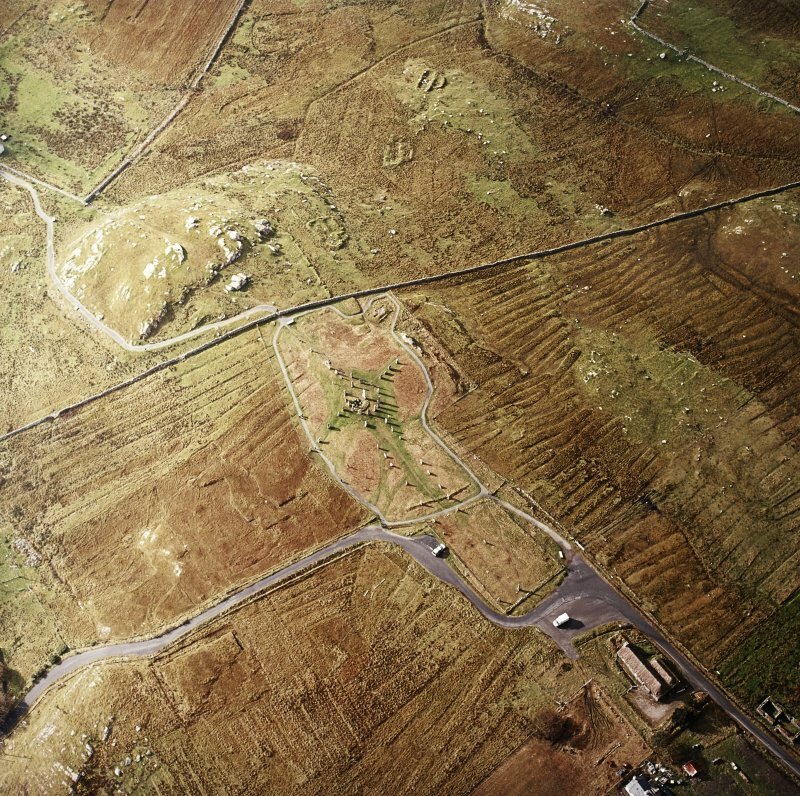 Oblique aerial view centred on the remains of the stone circle, chambered cairn and stone alignments with the township and lazy beds adjacent, taken from the NNE. 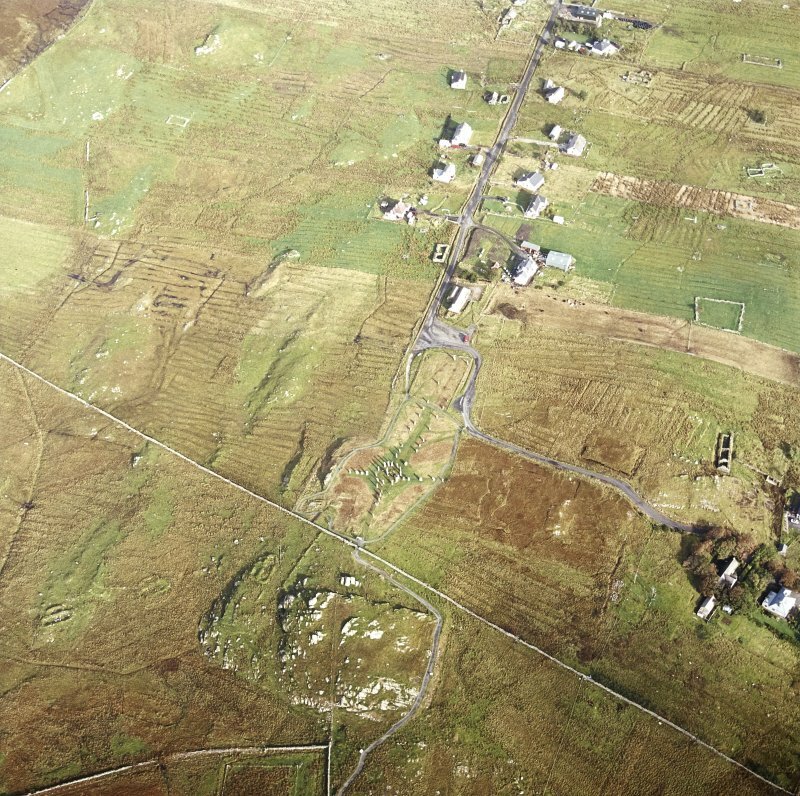 Oblique aerial view centred on the remains of the stone circle, chambered cairn and stone alignments with the township and lazy beds adjacent, taken from the NNW. 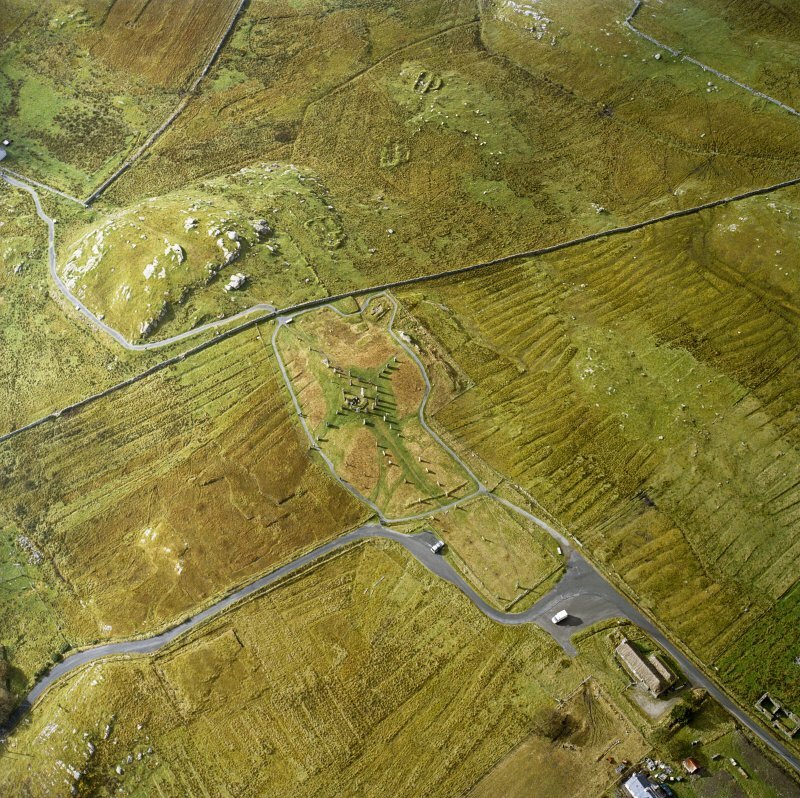 Oblique aerial view centred on the remains of the stone circle, chambered cairn and stone alignments with the blackhouse and lazy beds adjacent, taken from the NNE. 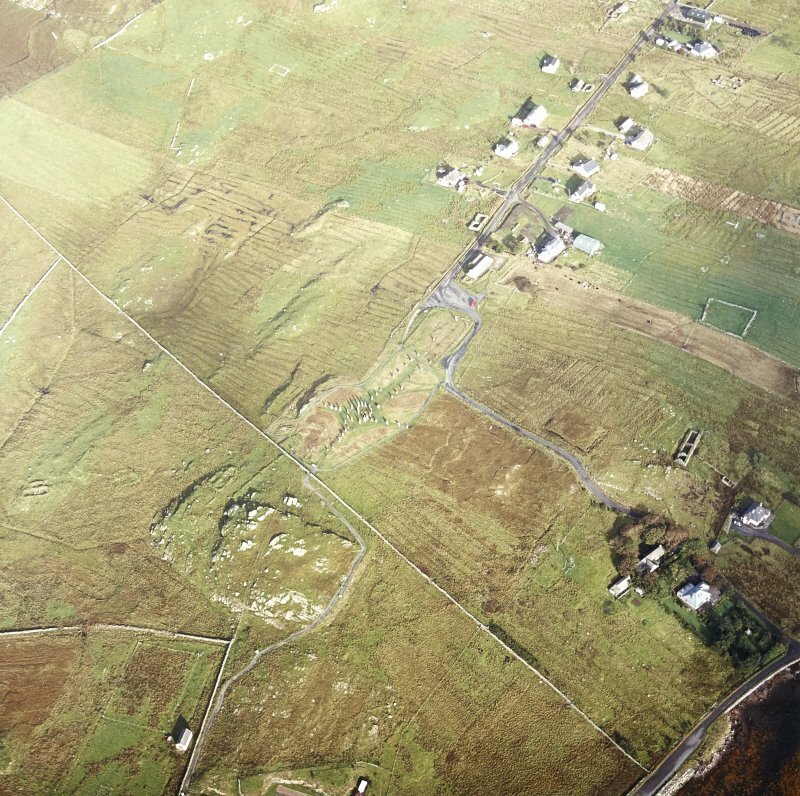 Oblique aerial view centred on the remains of the stone circle, chambered cairn and stone alignments with the township and lazy beds adjacent, taken from the NW. 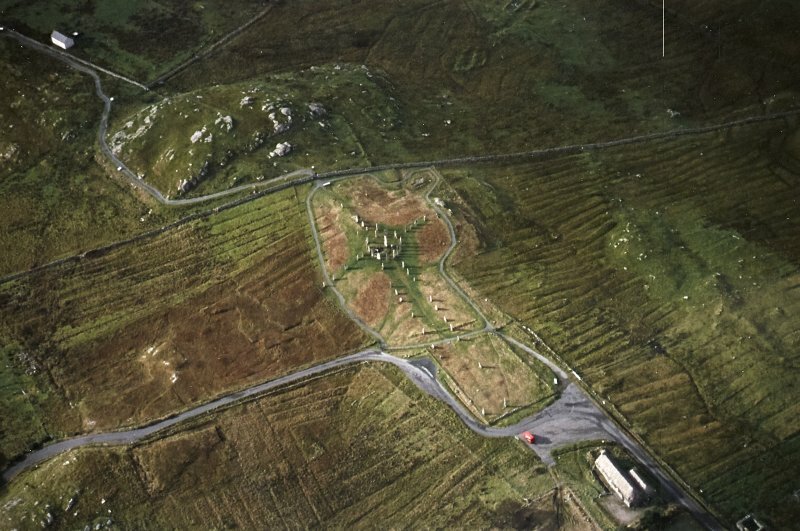 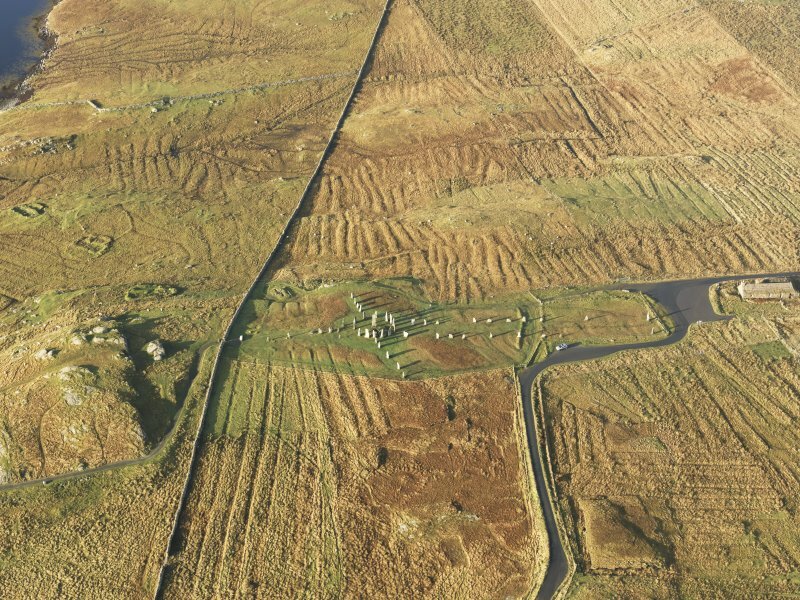 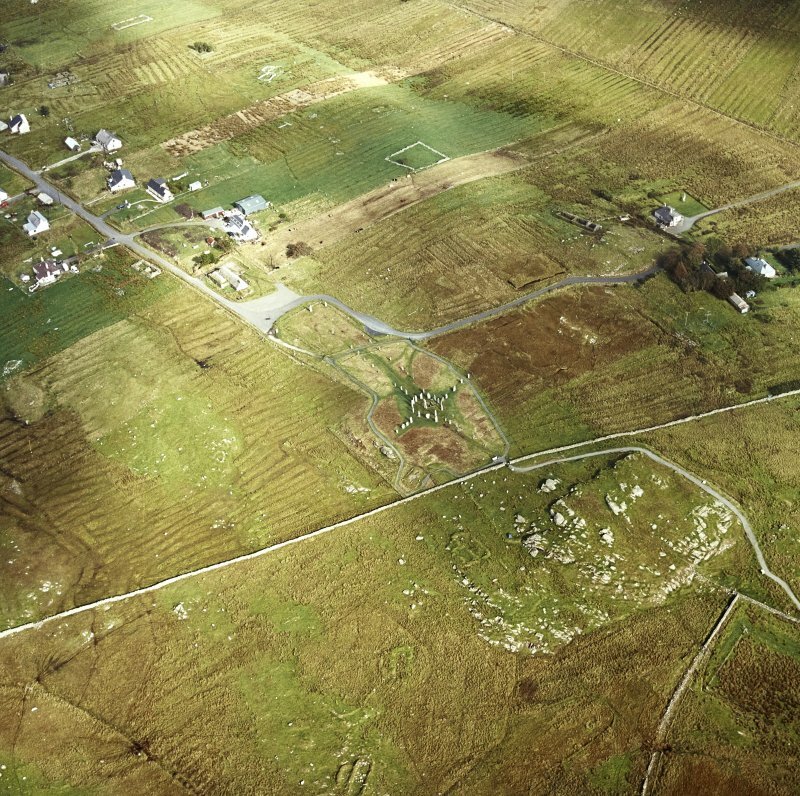 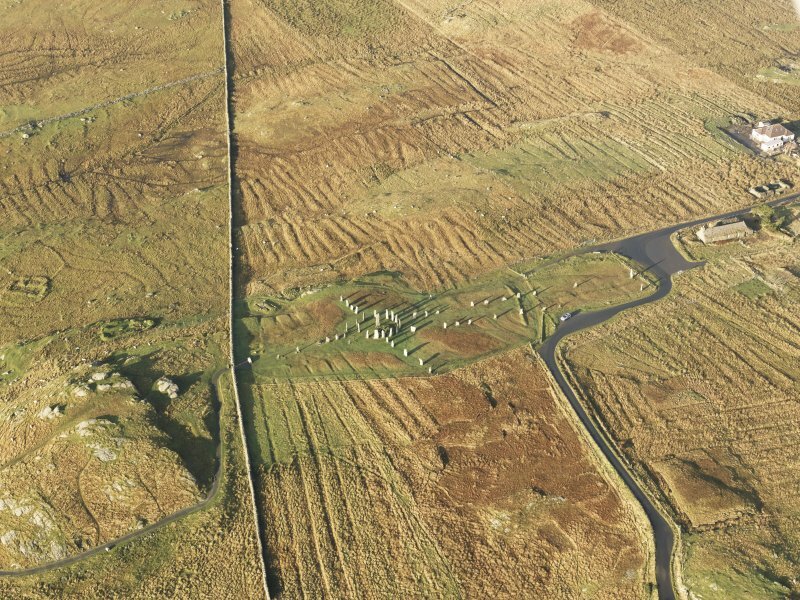 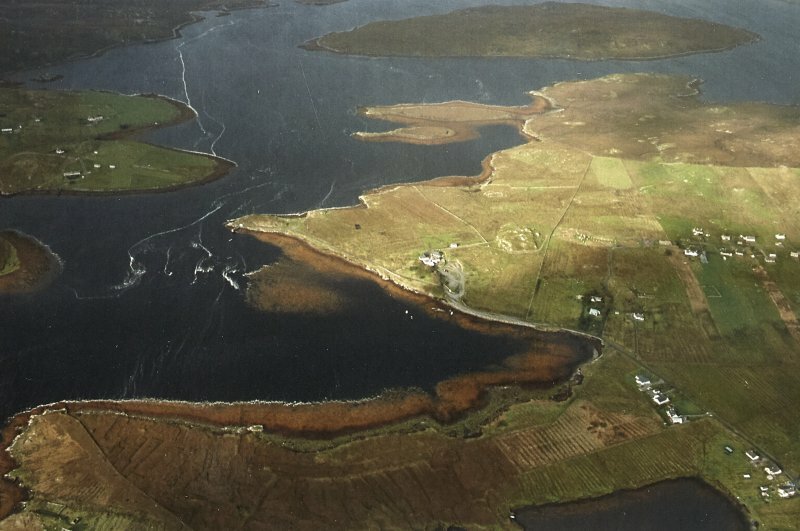 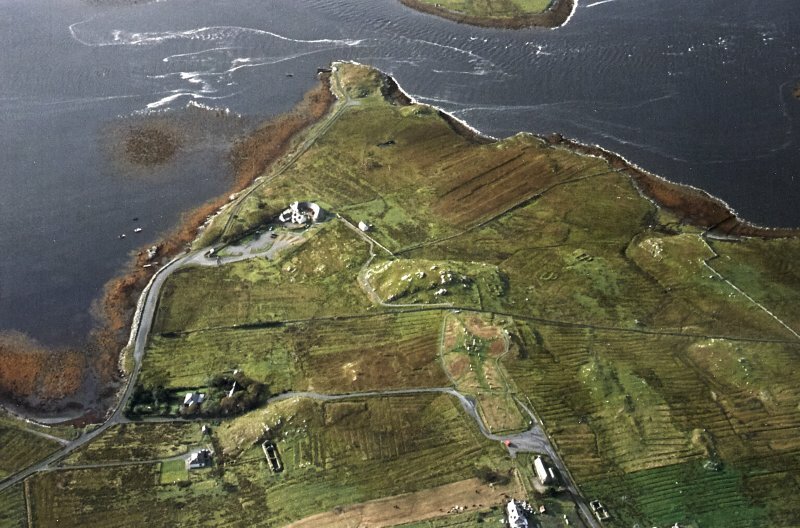 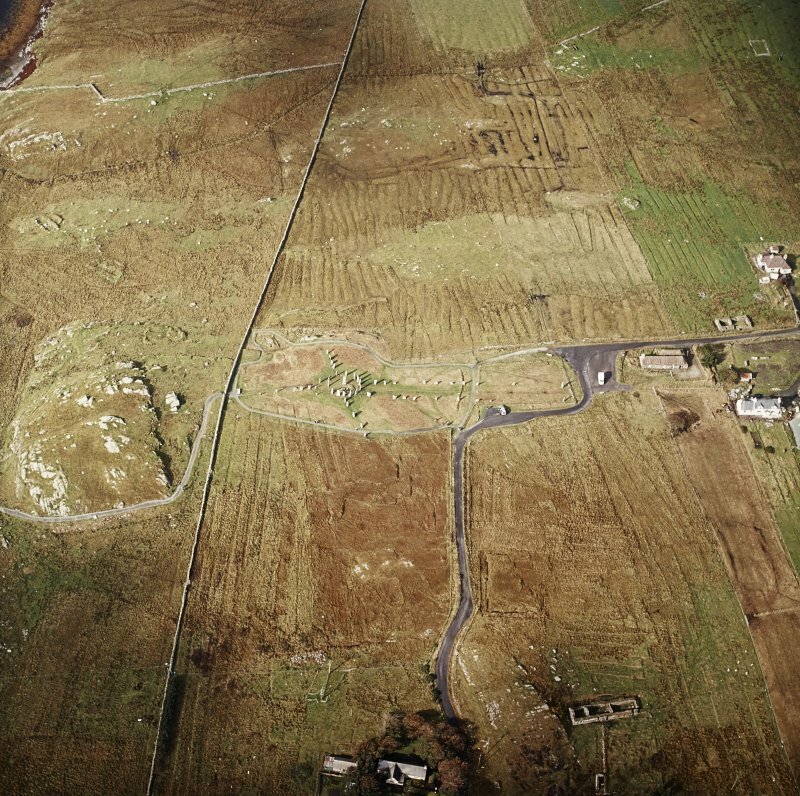 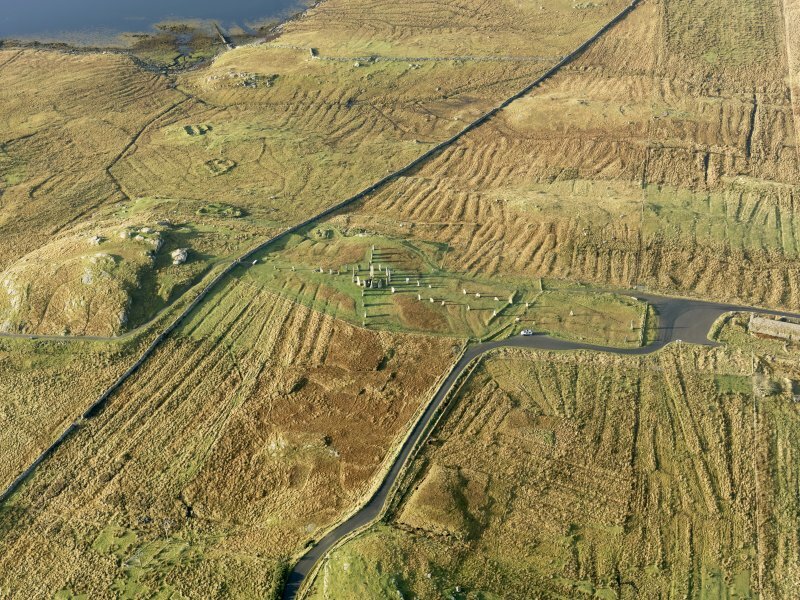 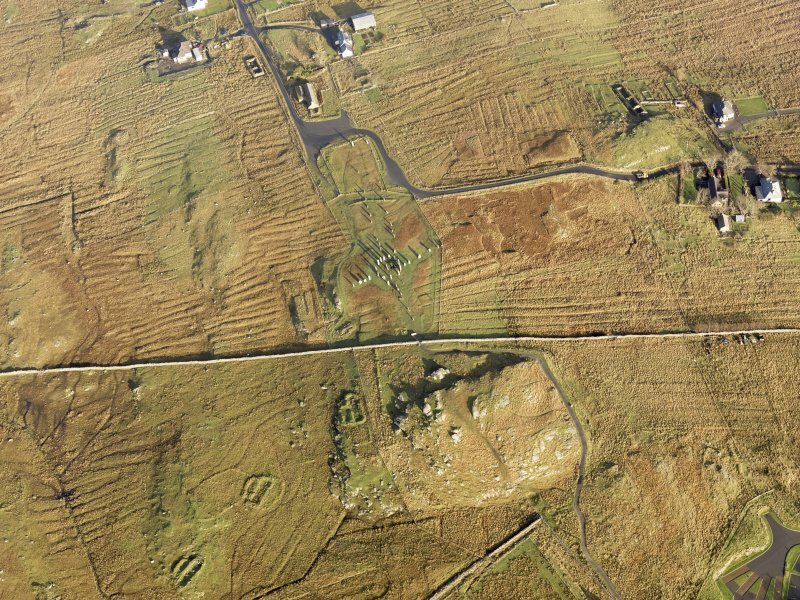 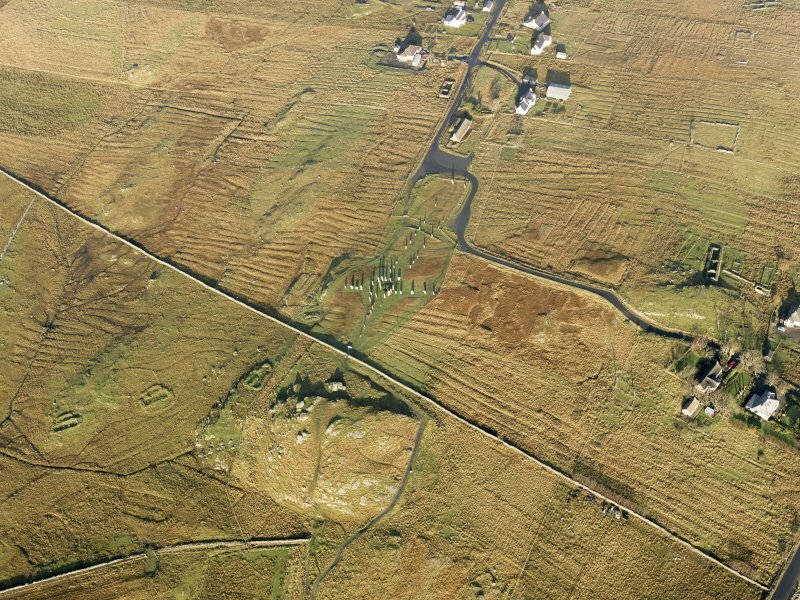 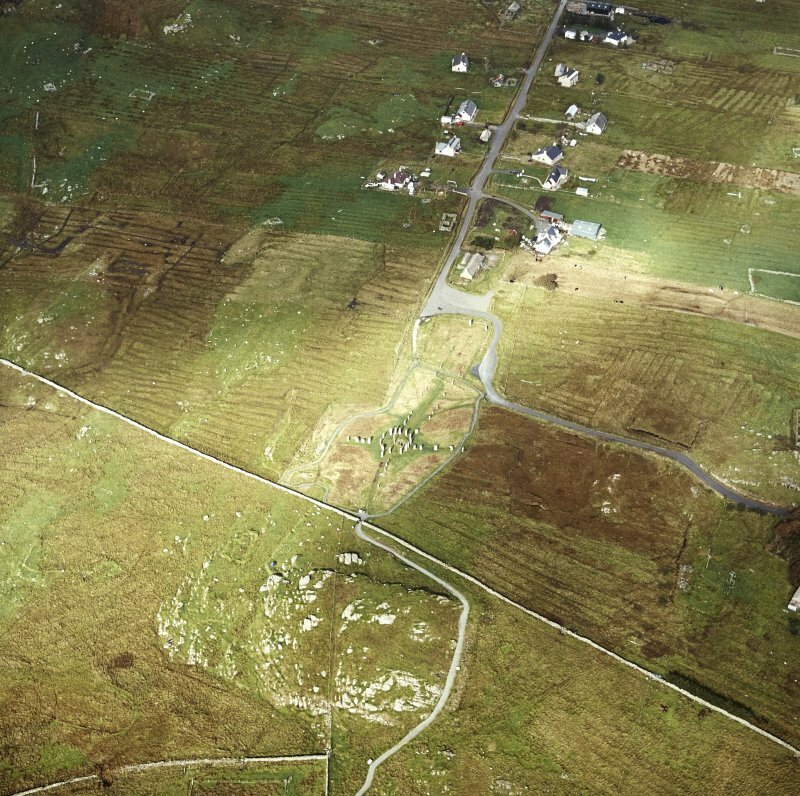 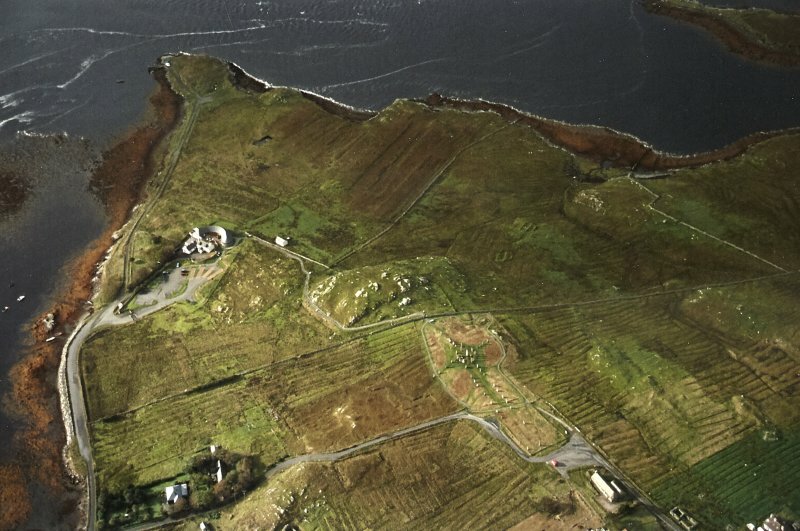 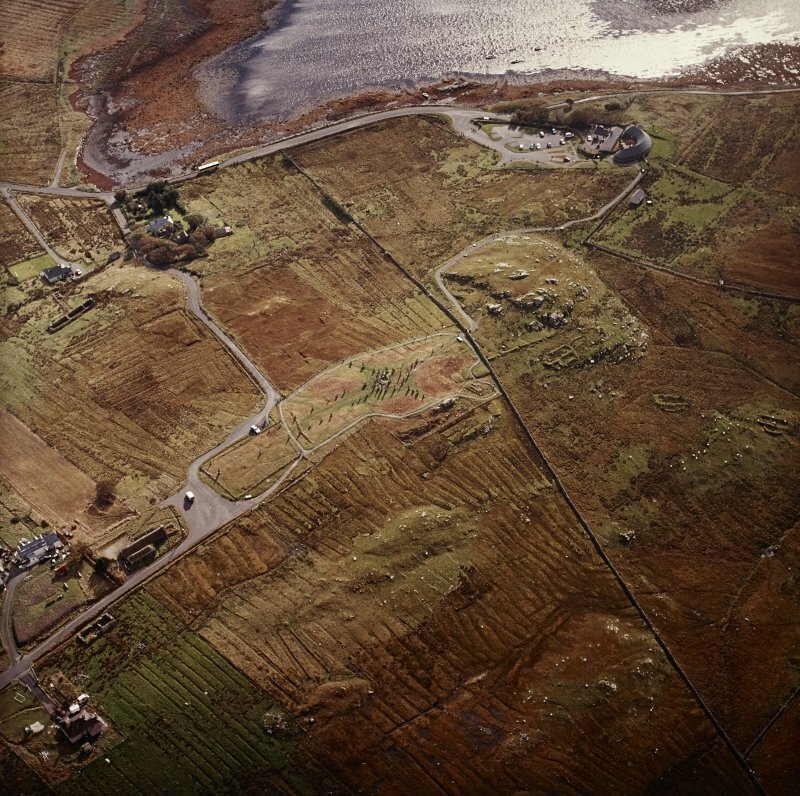 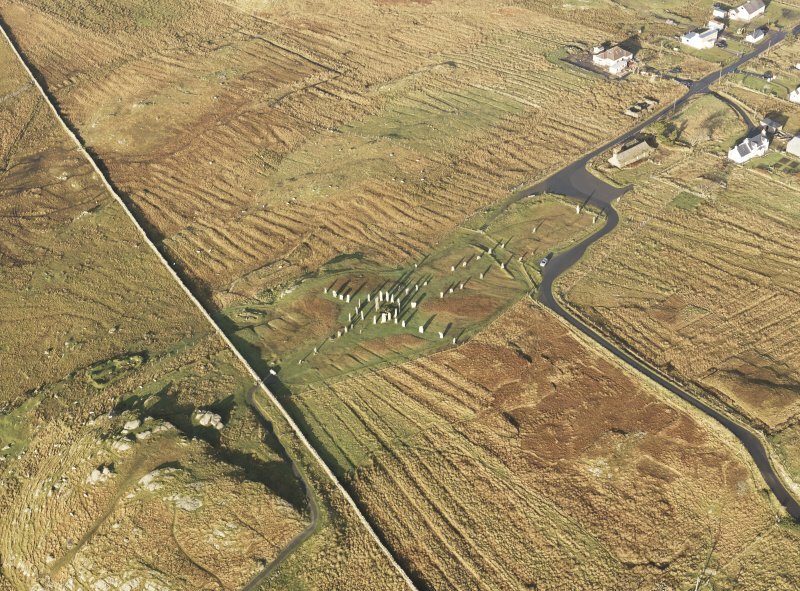 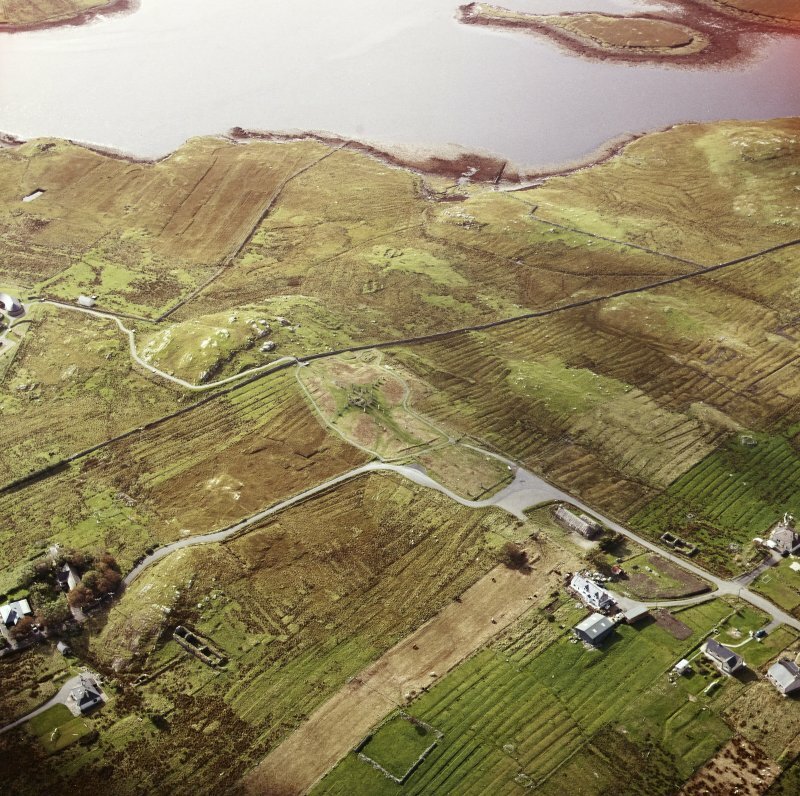 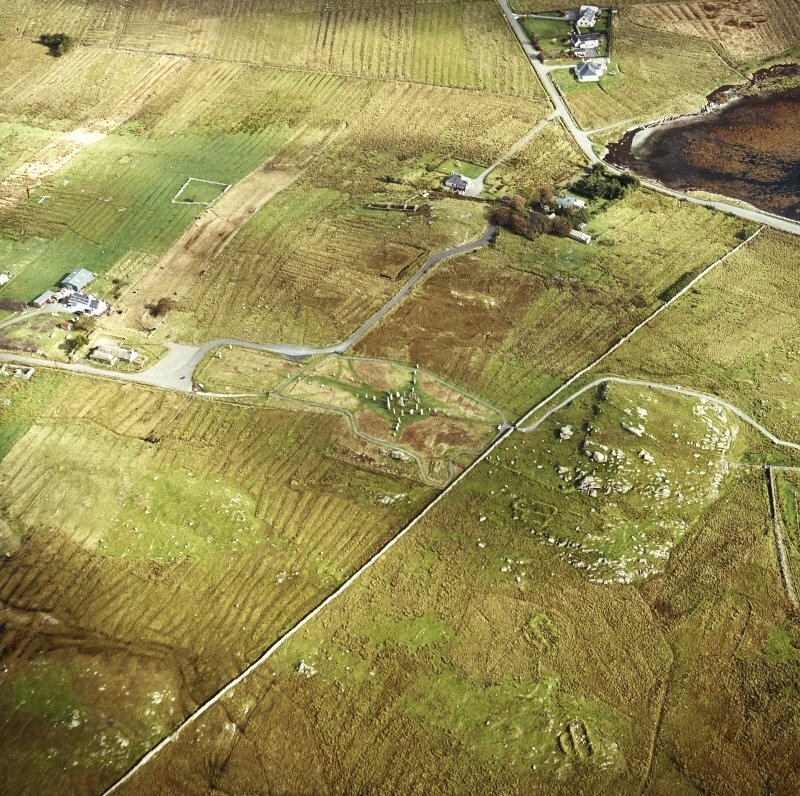 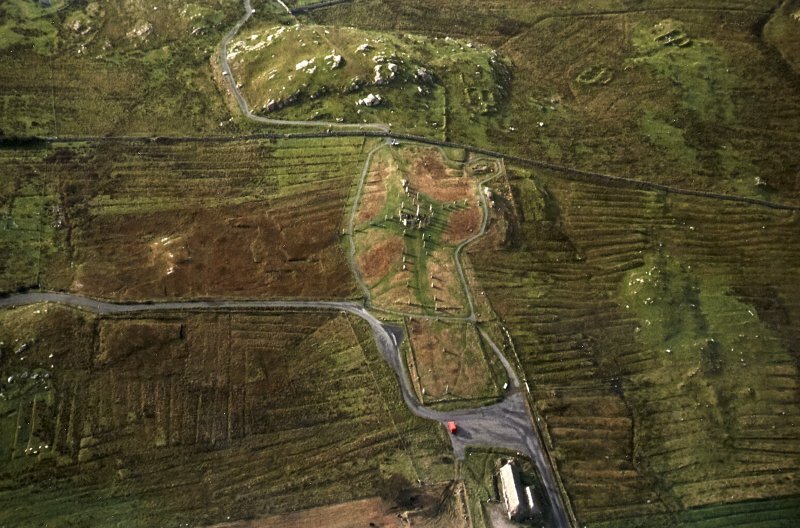 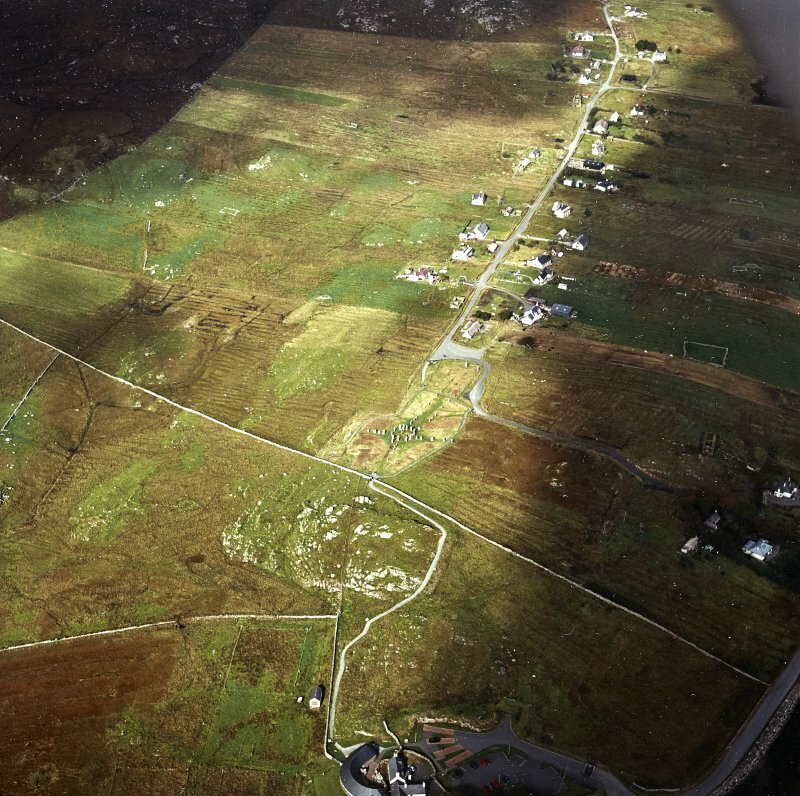 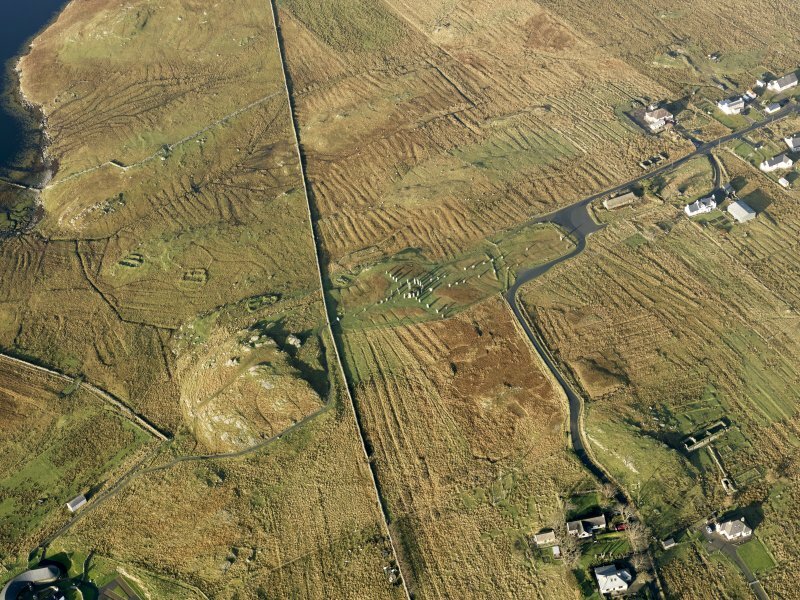 Oblique aerial view centred on the remains of the stone circle, chambered cairn and stone alignments with the township and lazy beds adjacent, taken from the SSE. 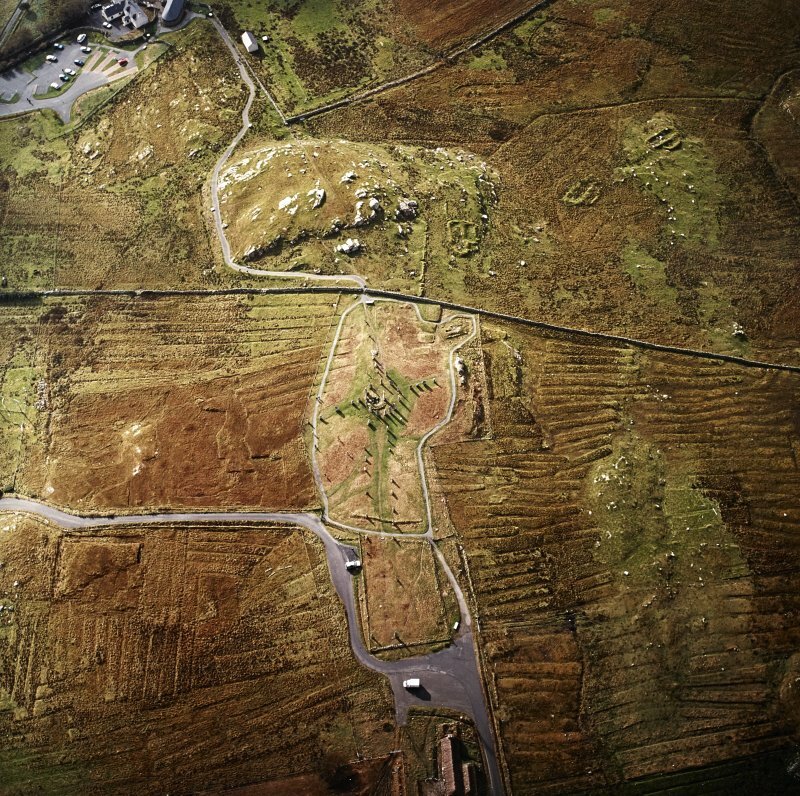 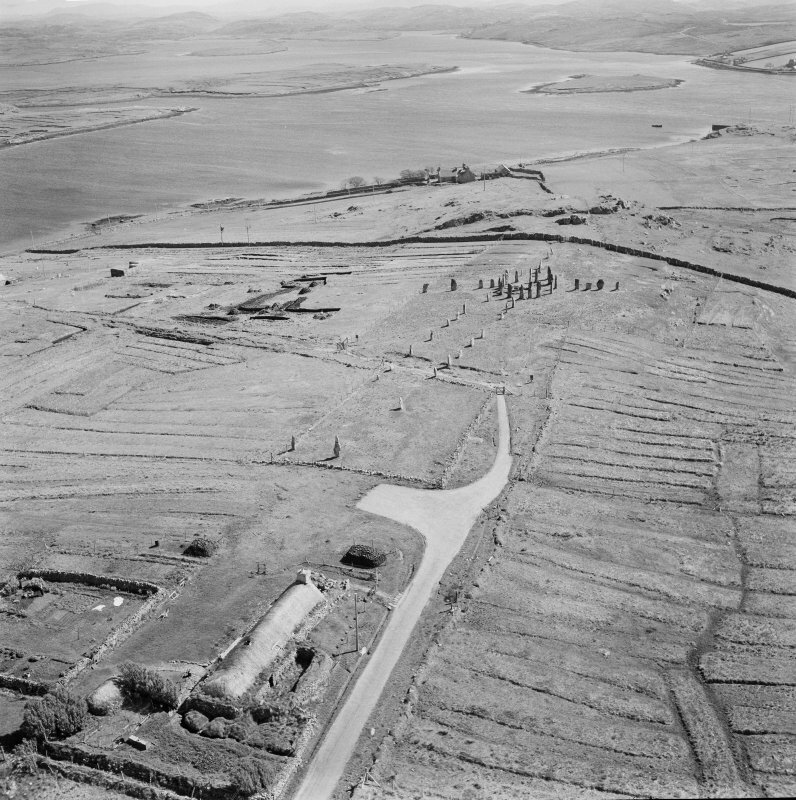 General oblique aerial view looking across the remains of the stone circle, stone alignments and township, taken from the SSW. 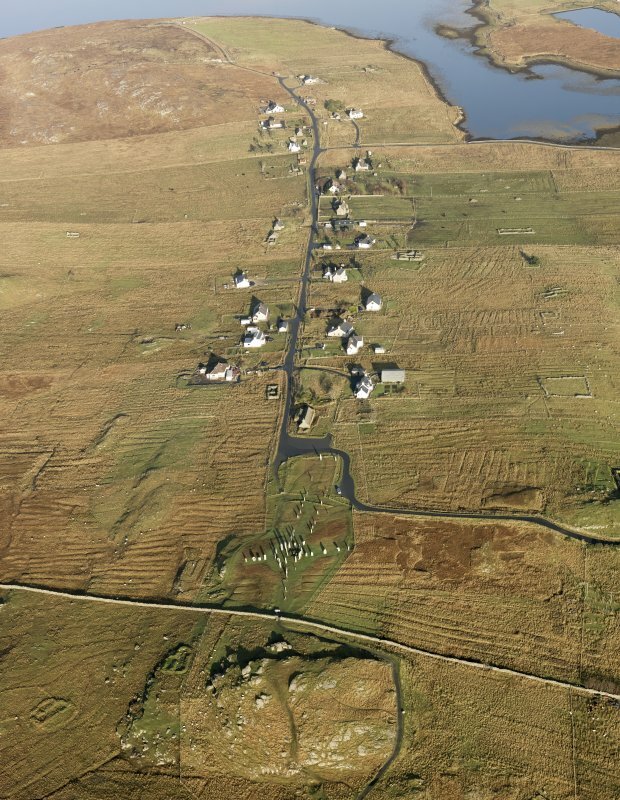 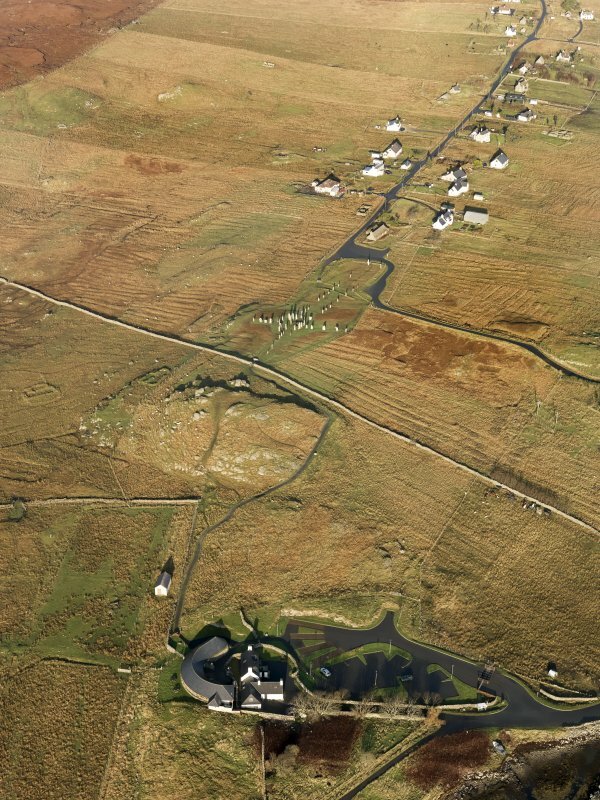 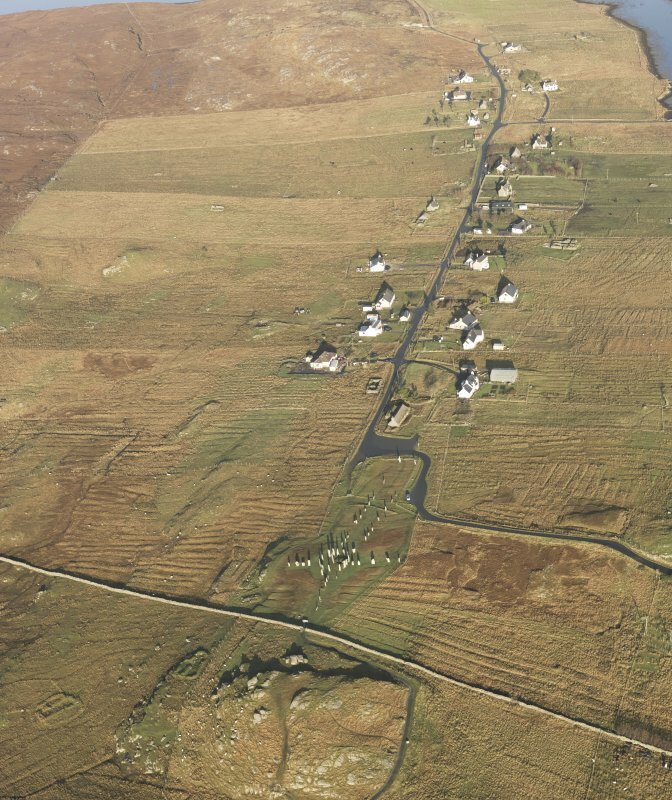 Oblique aerial view centred on the stone circle and stone row, the remains of the buildings and lazy beds at Calanais, taken from the W.
Oblique aerial view centred on the stone circle and stone row, the remains of the buildings and lazy beds at Calanais, taken from the SSE. 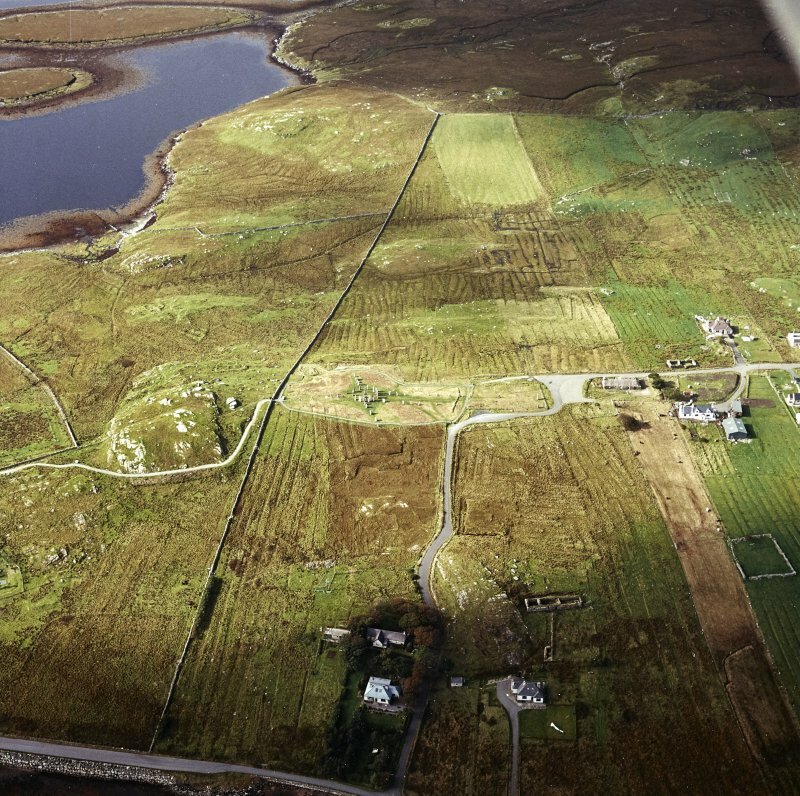 Oblique aerial view centred on the stone circle and stone row, the remains of the buildings and lazy beds at Calanais, taken from the SW.
Oblique aerial view centred on the stone circle and stone row, the remains of the buildings and lazy beds at Calanais, taken from the ENE. 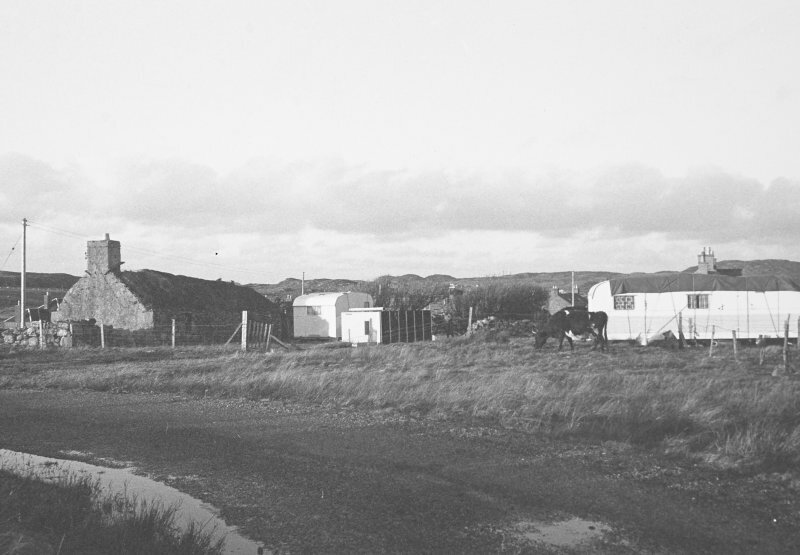 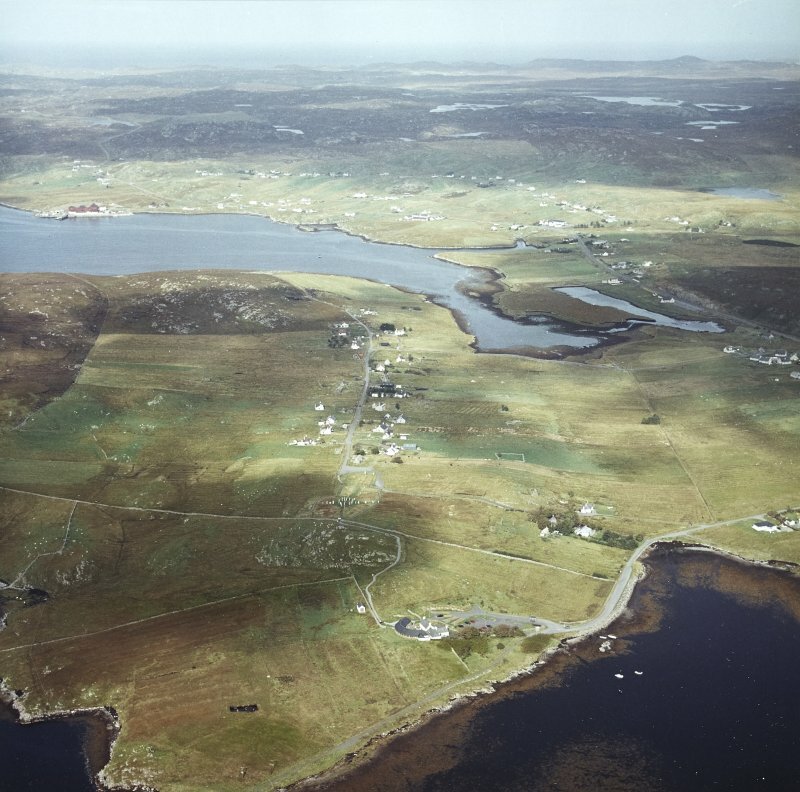 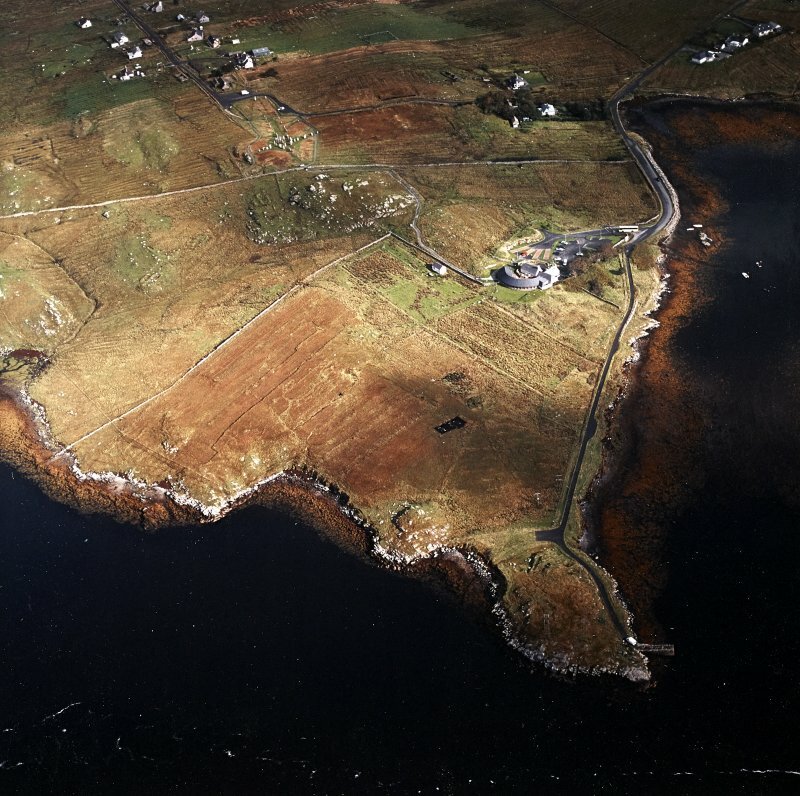 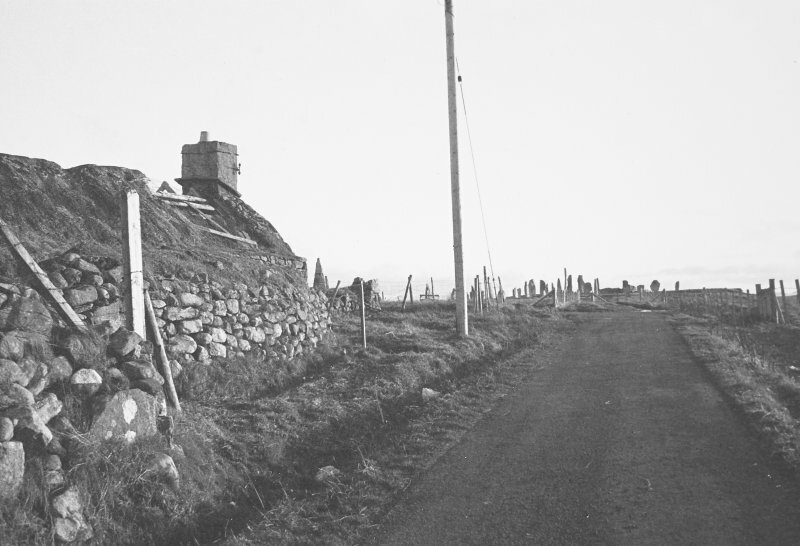 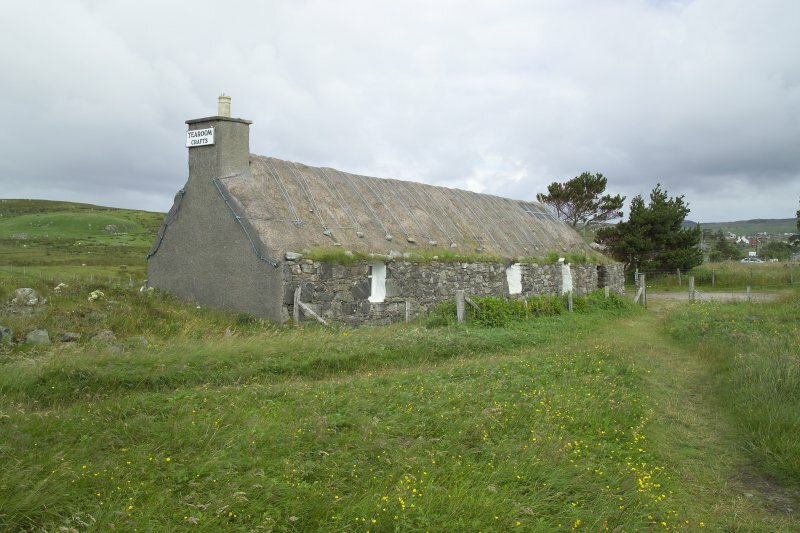 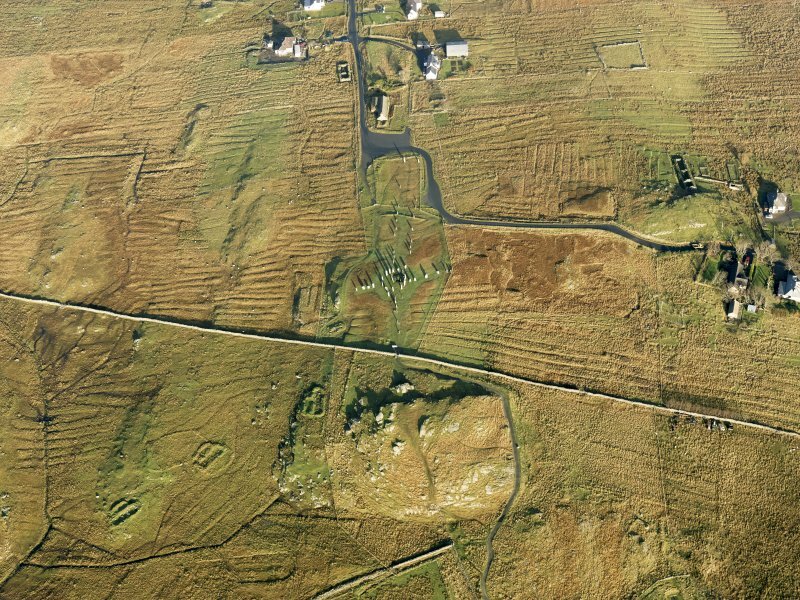 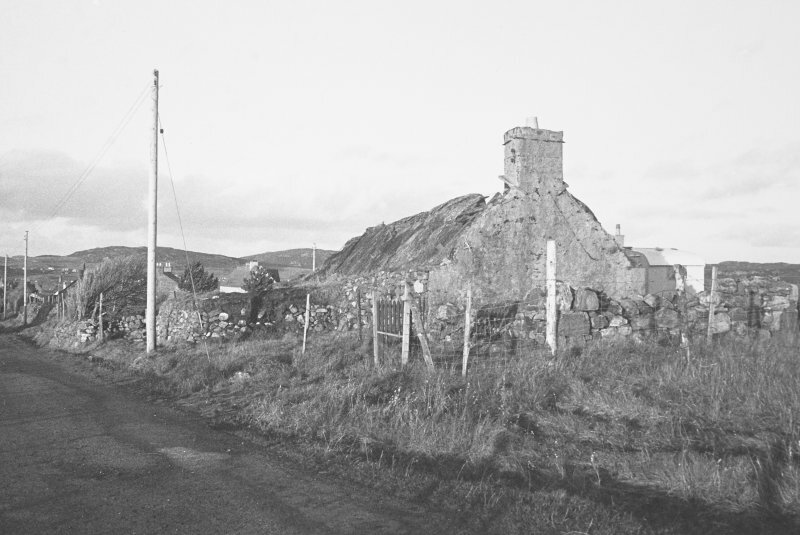 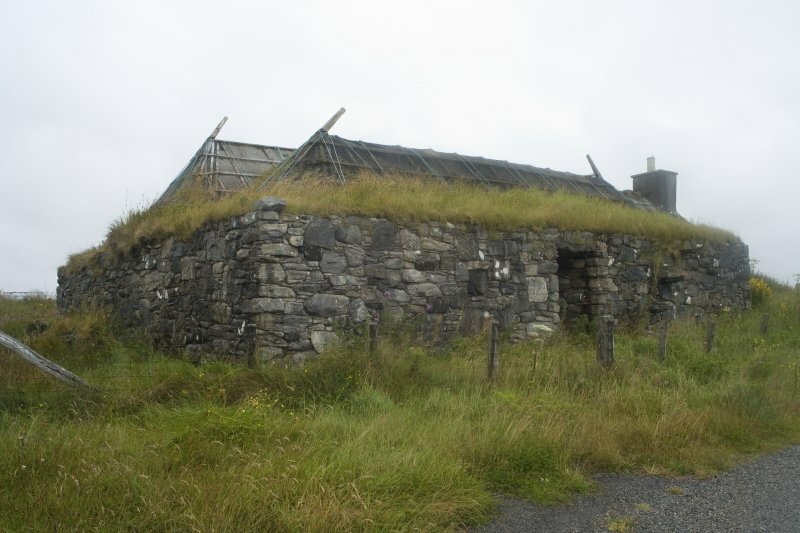 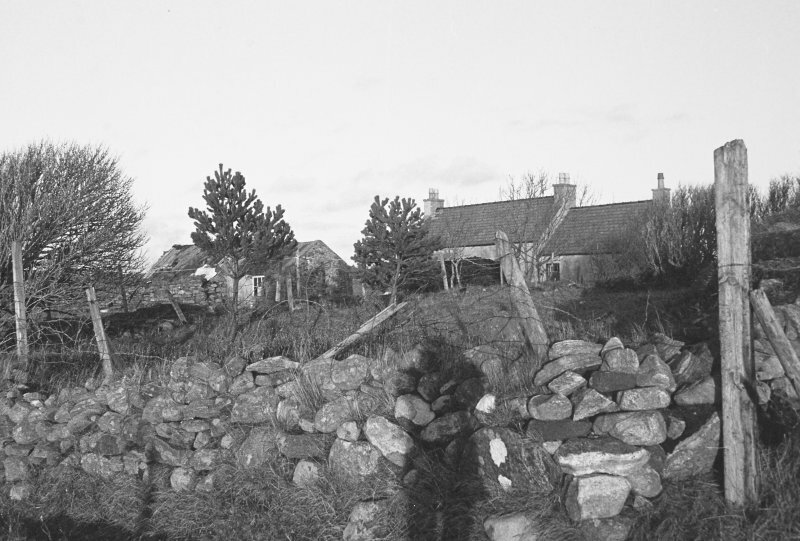 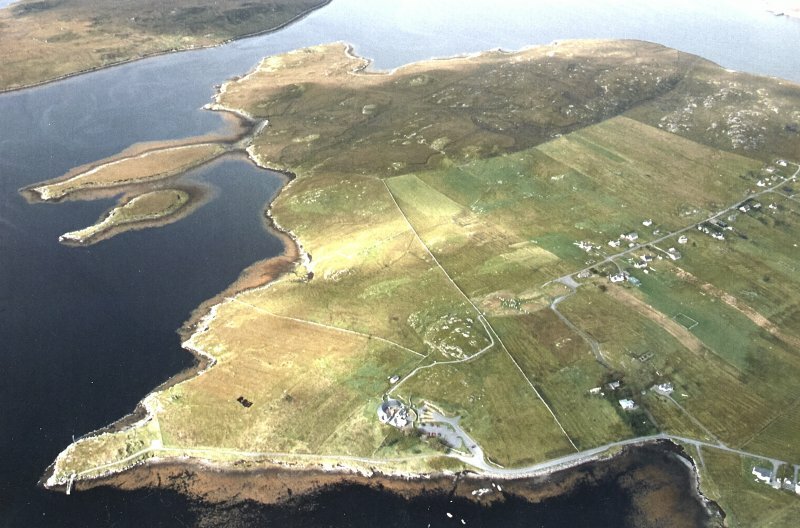 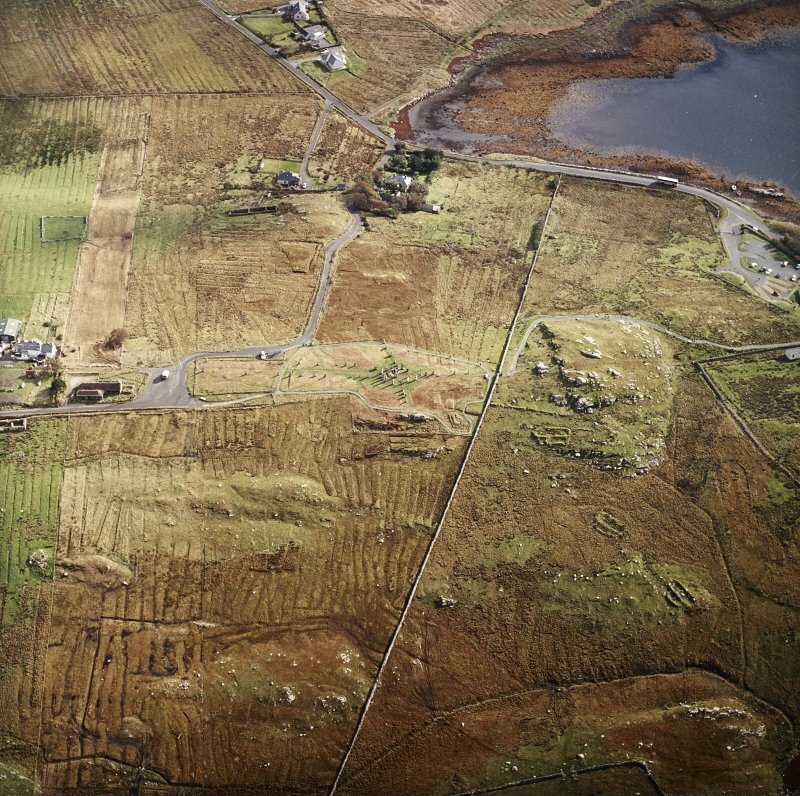 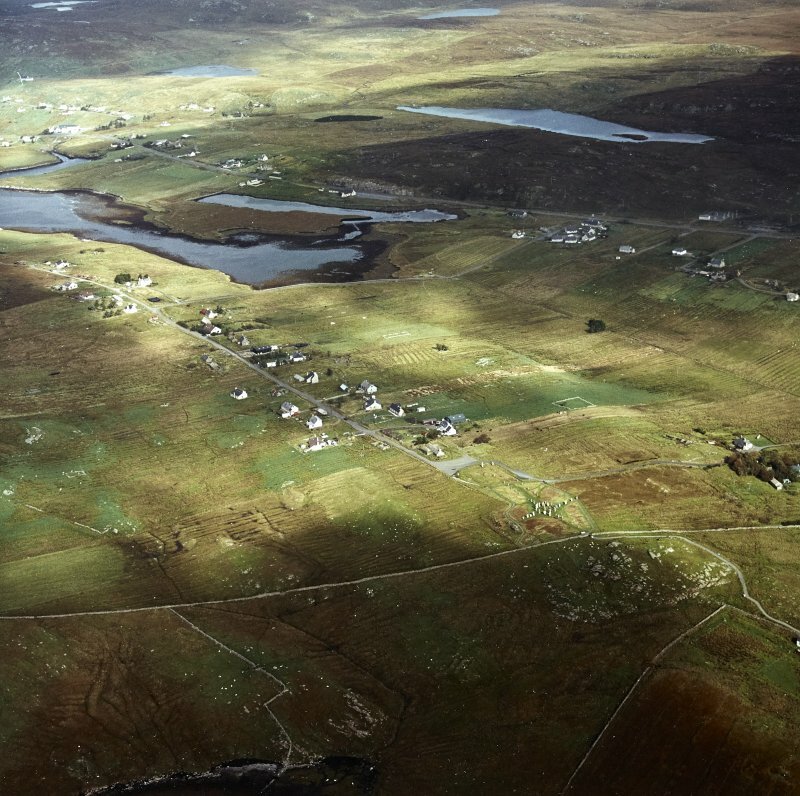 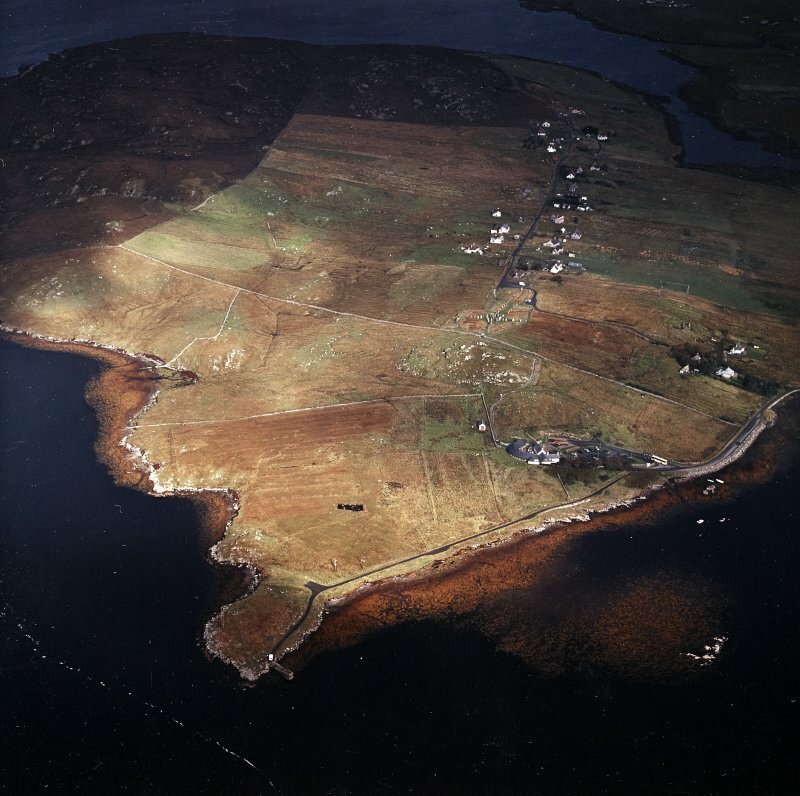 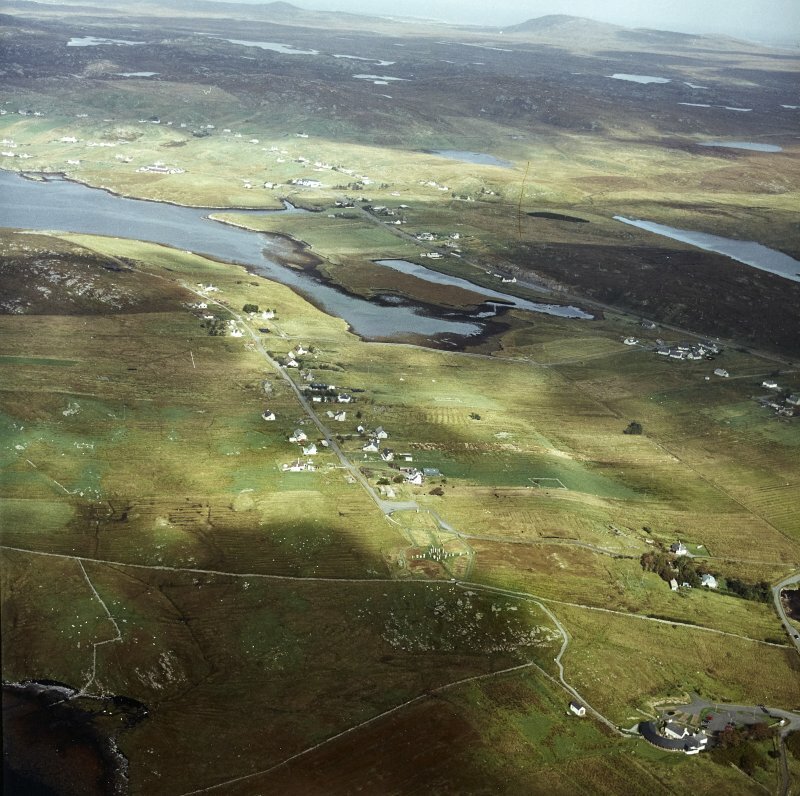 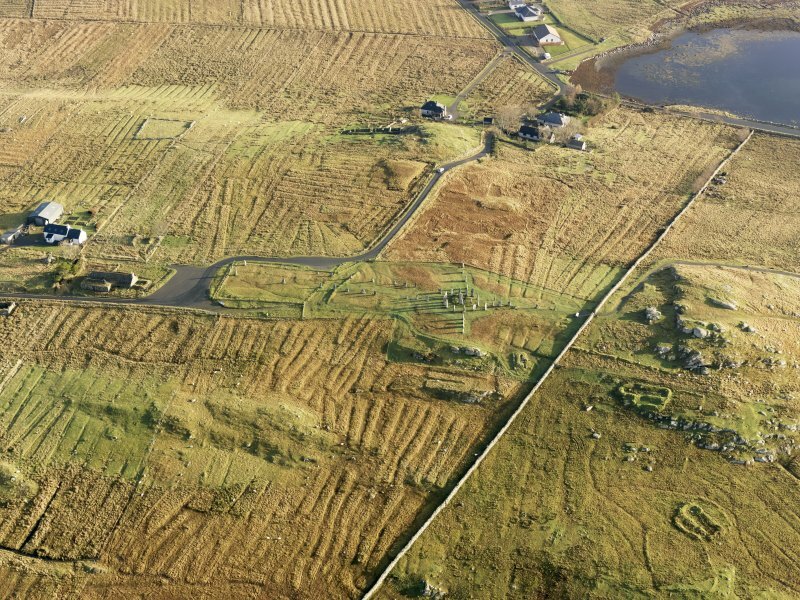 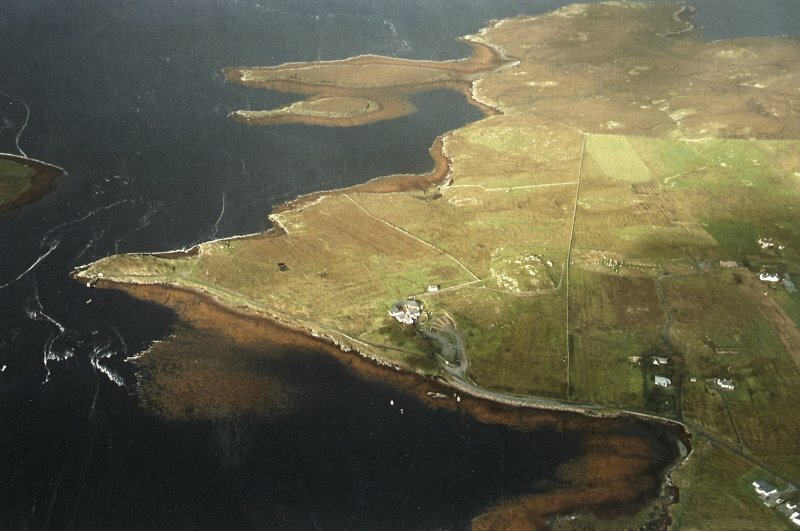 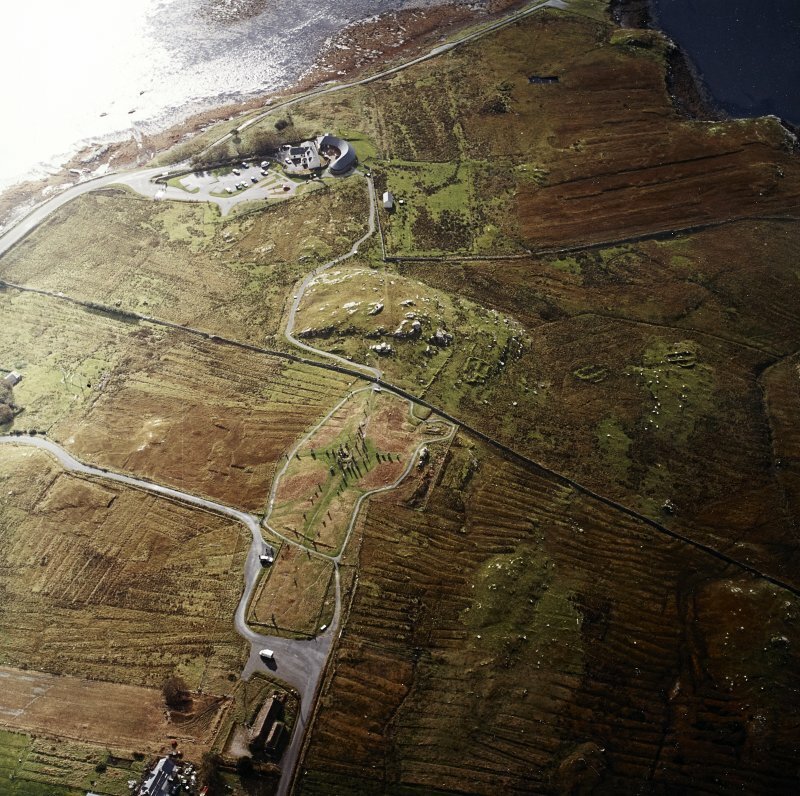 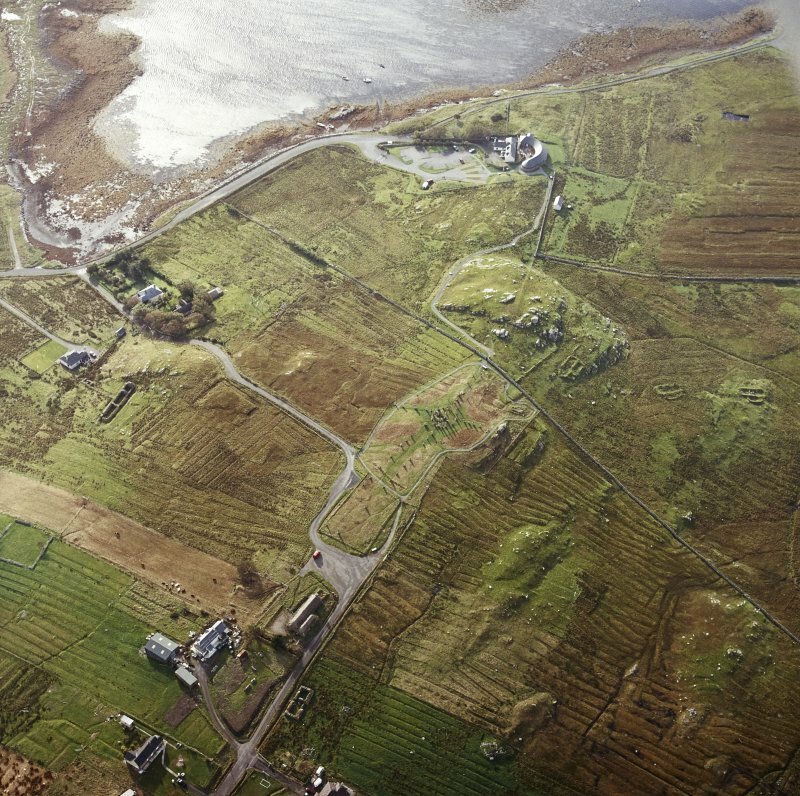 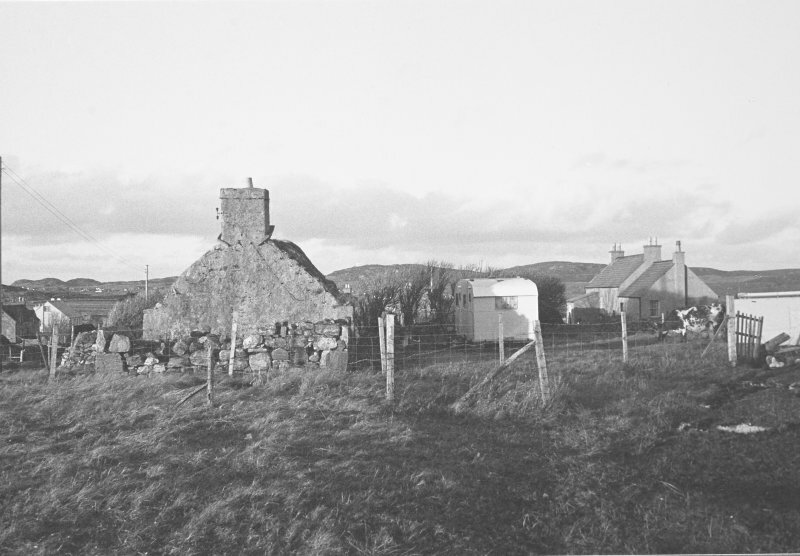 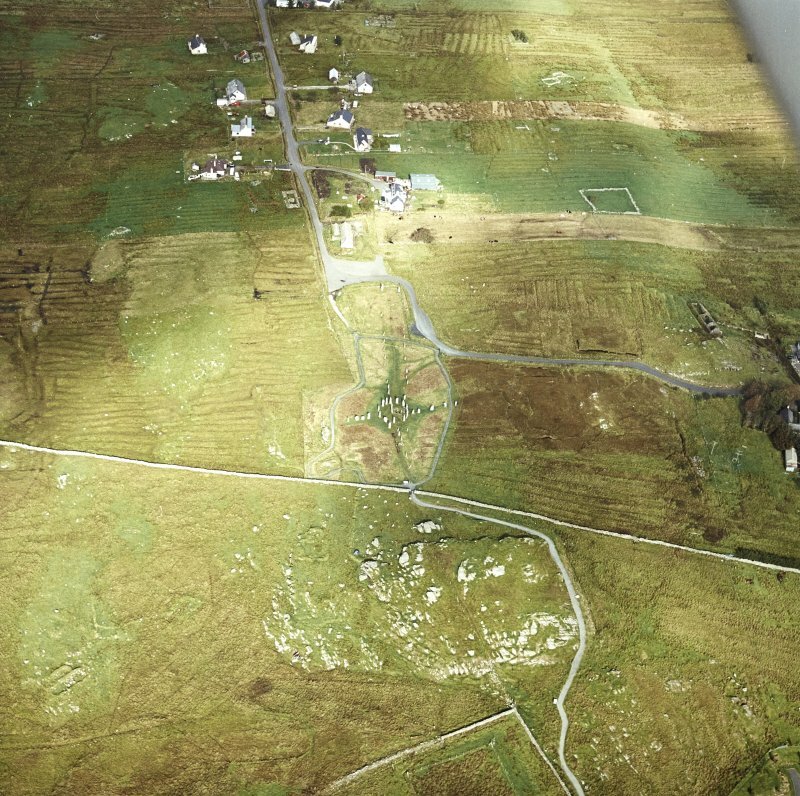 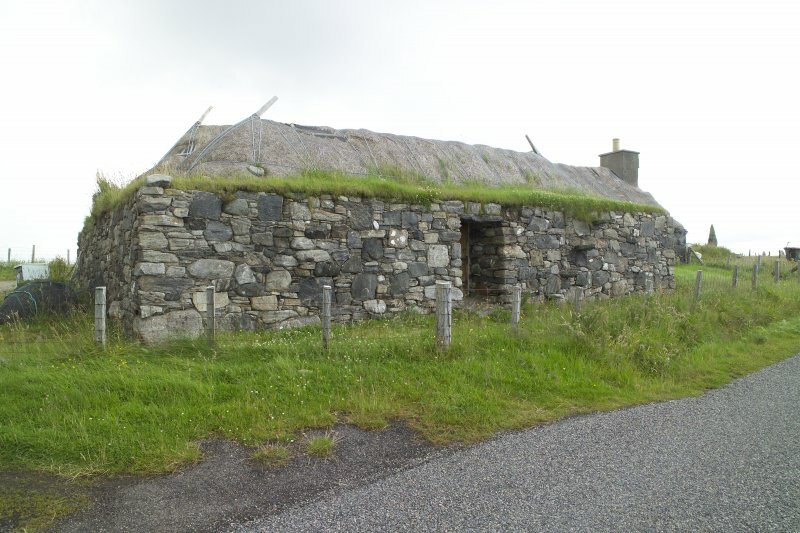 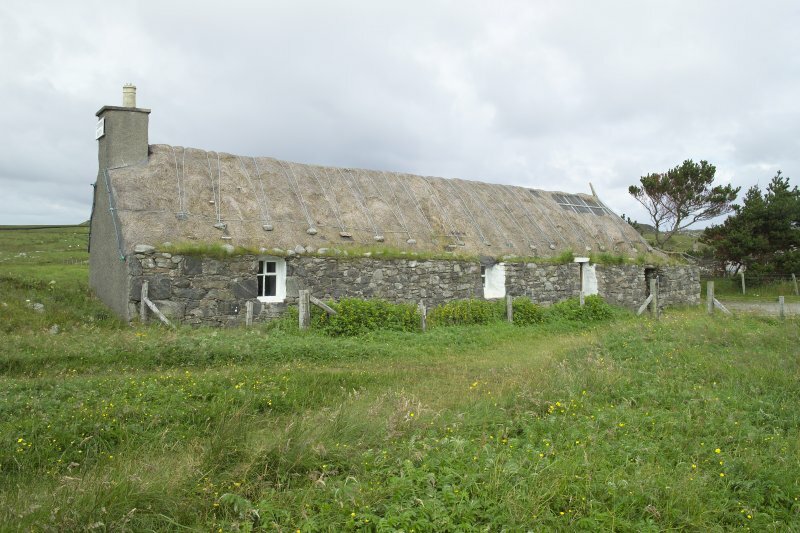 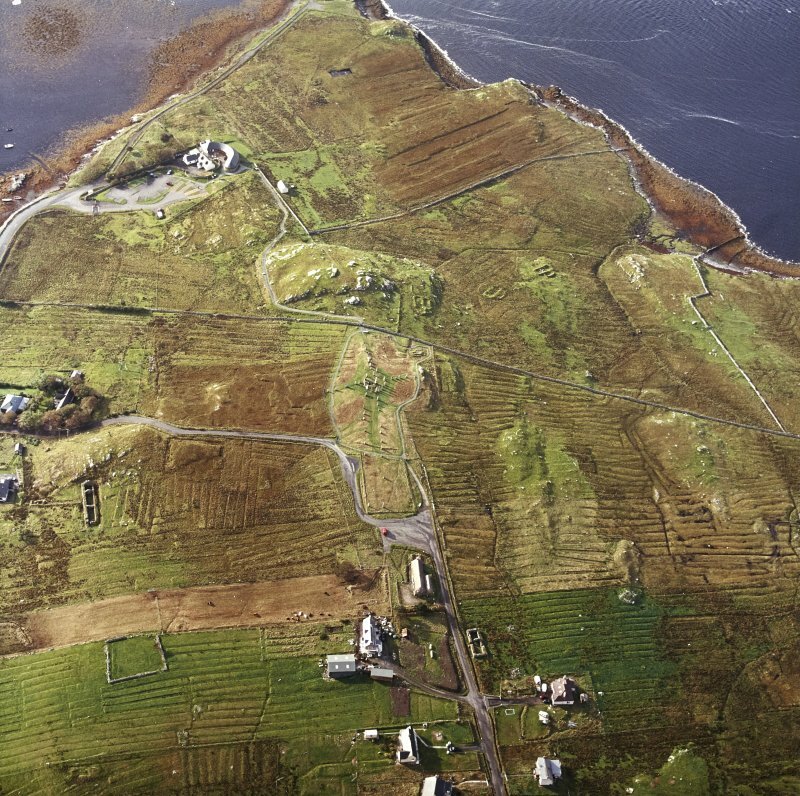 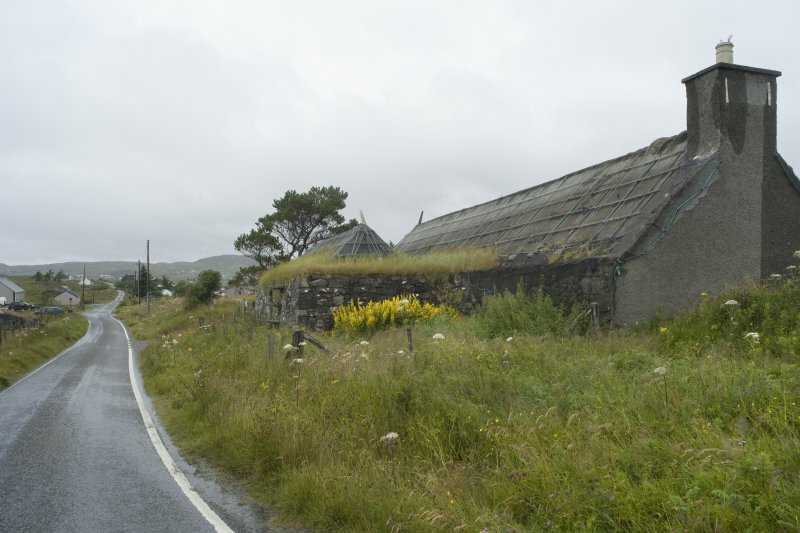 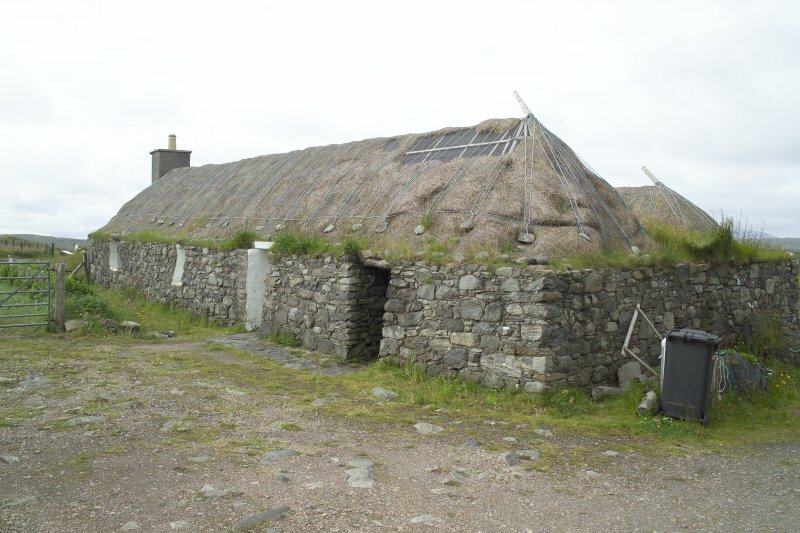 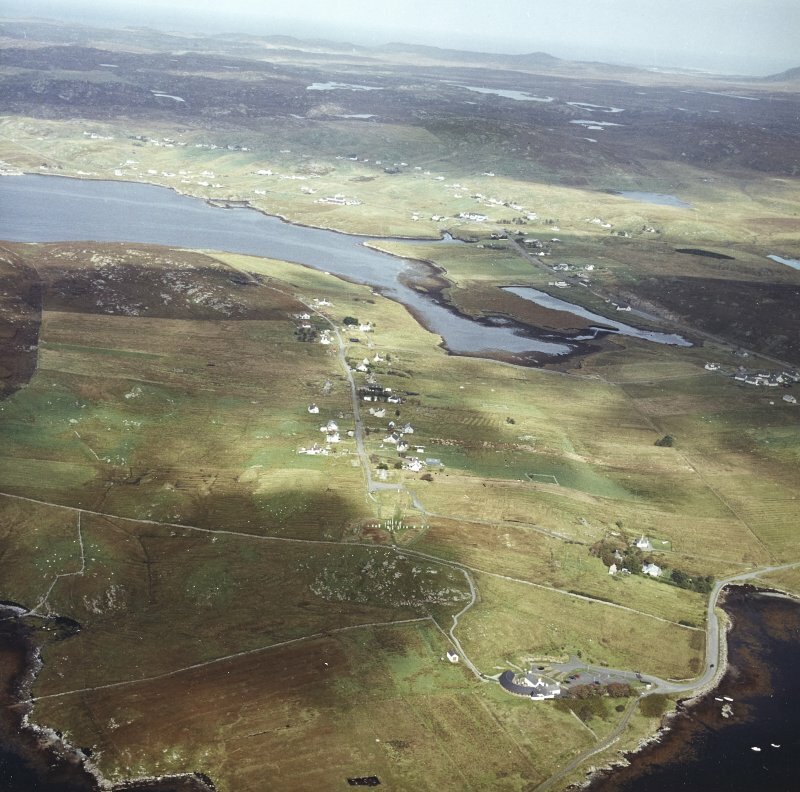 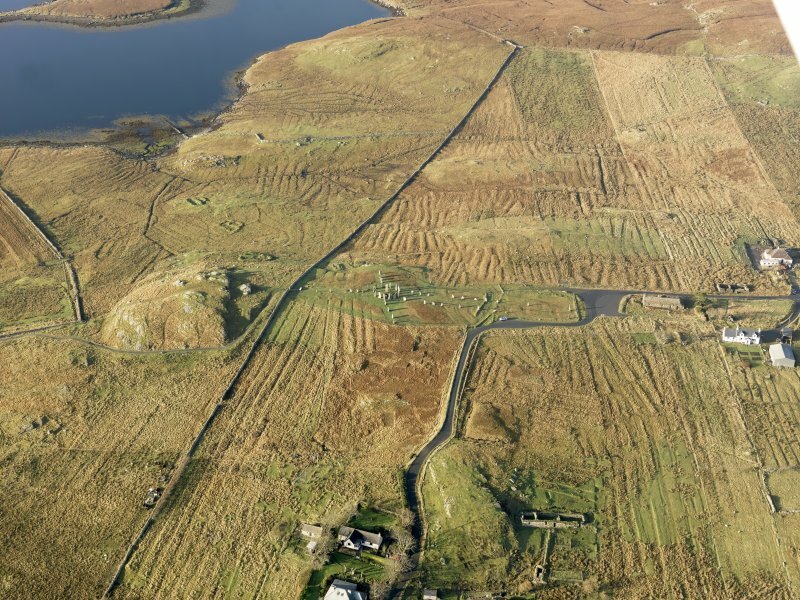 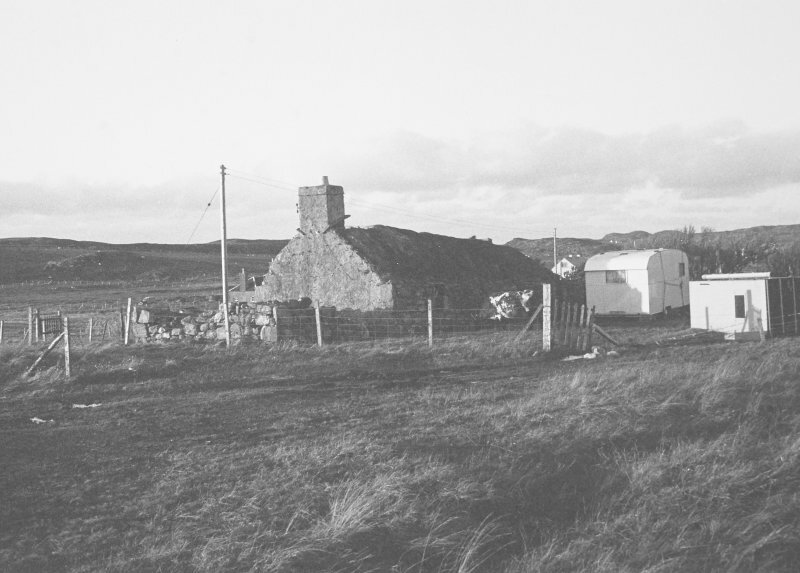 Oblique aerial view centred on the stone circle and stone row, the remains of the buildings and lazy beds at Calanais, taken from the ESE. 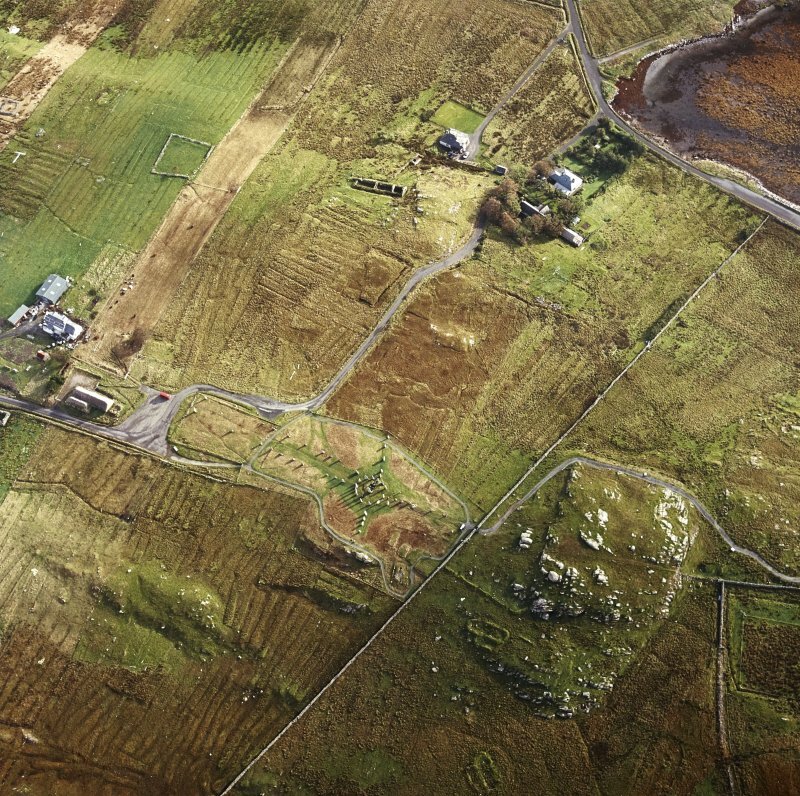 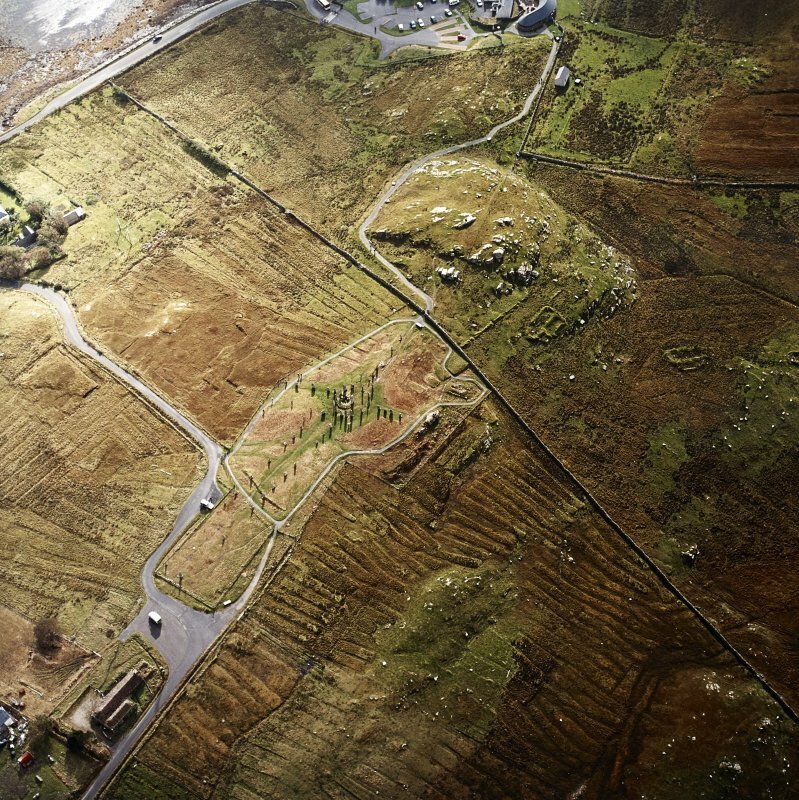 General oblique aerial view centred on the remains of the stone circle, chambered cairn and stone alignments with the farmhouse, visitor centre and township adjacent, taken from the NNE. 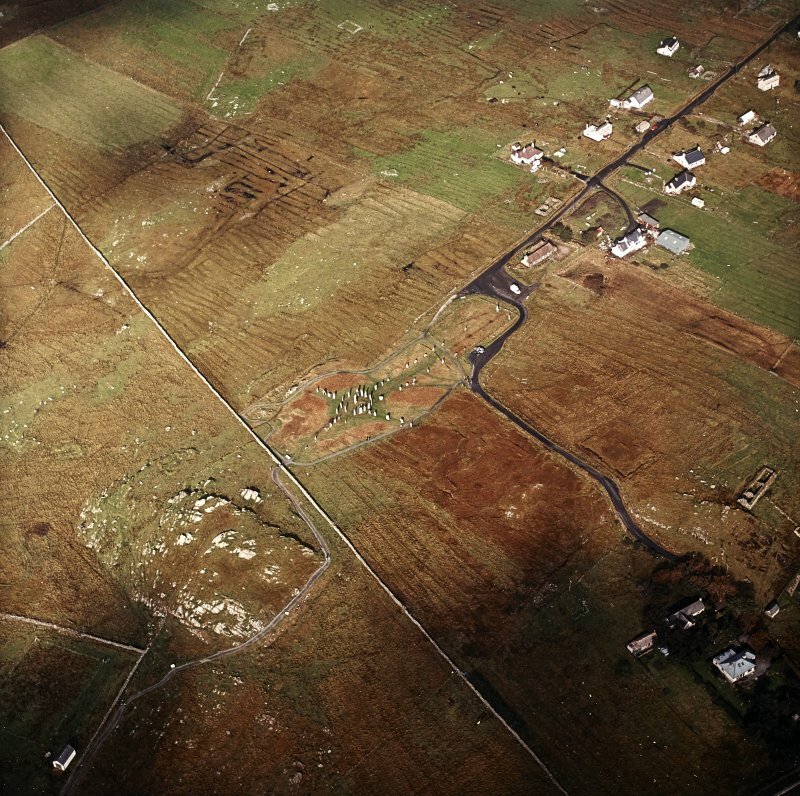 Oblique aerial view centred on the remains of the stone circle and stone alignments with the township and lazy beds adjacent, taken from the SSW. 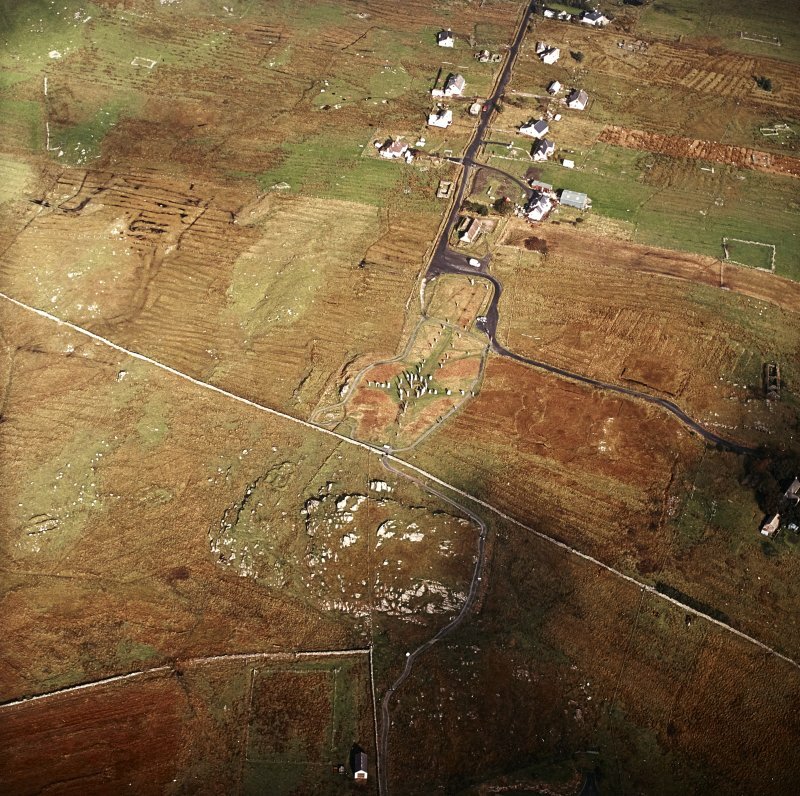 General oblique aerial view looking across the remains of the stone circle, stone alignments and township, taken from the S.
General oblique aerial view centred on the stone circle and stone row, the remains of the buildings and lazy beds at Calanais, taken from the S.
Oblique aerial view centred on the remains of the stone circle, chambered cairn and stone alignments with the township and lazy beds adjacent, taken from the N.
General oblique aerial view centred on the stone circle and stone row, the remains of the buildings and lazy beds at Calanais on the Isle of Lewis, taken from the SSW.